Oklahoma has more drivable miles of Route 66 than any other state, and there are many Route 66 rallies and festivals. There are events in El Reno, Bristow,Clinton, Bethany, Elk City, Sapulpa, Kelleyville, Claremore, Venita, Foyil,Eric and Tulsa. When you come into Oklahoma from Kansas, you will be on the Quapaw Reservation. The short ride from Quapaw to Commerce, Mickey Mantle's hometown, is through beautiful rural grasslands. Close by Miami is a well preserved mid-western town filled with well-maintained early 20th centry buildings, including the 1929 Coleman Theater. Miami also has a vintage motorcycle museum. 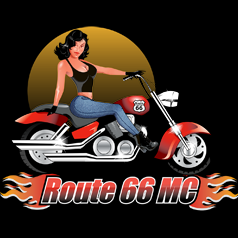 After leaving Miami, you will begin several hundred miles of some of the best Route 66 riding anywhere. The ride to Tulsa passes through many rural towns on a well maintained roadway that will allow you to make good time. You will pass by the world's largest totem pole near Foyil; Will Roger's hometown of Claremore; and Catoosa's Blue Whale, which is one of the most notable Route 66 attractions. The ride into Tulsa on 11th St has many vintage motels and restaurants. The 11th St Pub and the Hurricane Lounge are two Old School biker bars along the route. The newly restored Campbell Hotel is one of the nicest hotels along all of Route 66. Downtown Tulsa is an art deco museum in its own right. The ride from Tulsa to Oklahoma City is even better. The countryside gets a bit more rural, and the roadway has the turns and hills that bikers enjoy. You'll see the 1939 Rock Cafe' and the Skyliner Motel in Stroud, several restored gas stations and the world famous 1898 Big Round Barn in Arcadia. Oklahoma City has lots of preserved neighborhoods that are pretty much intact from the heyday of Route 66. It also has a solid set of biker bars, including the Thunder Roadhouse, Hobo's and Vic and Tim's. The ride from Oklahoma City to Weatherford is even more rural and goes along many miles of roadway out of sight of any interstate hiway. You'll go through Garth Brooks' hometown of Youkon; Ft Reno, which was established to protect settlers from Indian attacks; the famous Lucille's Roadhouse near Hydro; and the Thomas P Stafford Airport Museum in Weatherford, where you can see moon rocks. The last section of Oklahoma's Route 66 will take you to terrific Route 66 museums in Clinton and Elk City; the Trade Winds Motel in Clinton where Elvis stayed; and Roger Miller's hometown of Erick. You will see all this and much more in Oklahoma; but better still, Oklahoma Route 66 riding is superior. Have fun! Click here, to see the first town in Oklahoma, Quapaw.